Its a truism that electrical systems and electricity in general likely represent the greatest mystery for most vessel owners. If you are one of these folks, dont feel badly, you are not alone. Countless skippers have shared with me while aboard their boats, in emails, telephone calls, and in seminars, their self-professed lack of understanding on this subject. I fully understand the mystery that surrounds this system. Electricity falls into the category of faithyou simply have to believe its there even though you can neither see nor hear it, although, under the right, or perhaps the wrong, circumstances you most assuredly can feel it. You can also unknowingly suffer the effects of a faulty electrical system in ways that are not immediately obvious. If electricity represents a mystery, then it seems that bonding and grounding and the role they play in corrosion prevention are, to paraphraseWinston Churchill, A Riddle Wrapped in a Mystery Inside an Enigma. Many seemingly inexplicable corrosion problems are often chalked up to a bad ground, even by professionals. Strangely enough, this is sometimes accurate, however, the folks that make such proclamations arent always sure why this is so. Last winter, while inspecting PMM&apos;s own test vessel as it rested on blocks in a local boatyard, I noticed a sharp disparity in the consumption rate of the two transom anodes (commonly referred to as zincs, the proper term is anode, as its possible that they may be cast from an alloy other than zinc, such as aluminum in the case of PMM&apos;s test vessel). One had been consumed, at a rate that I would consider consistent with the vessels season afloat, by roughly 50 percent, the other remained in near-virgin condition. Id seen this phenomenon before and knew something was amiss. I discussed the observation with Ryan McQueeney, president of Marine Technical Services, the firm PMM has been using to carry out electrical and electronic repairs and upgrades aboard our vessel. He agreed to carry out a few tests to determine the cause of the uneven consumption. Ill return to that story in Part II of this series of articles. The bonding system is used to interconnect, among other things, underwater metals such as through-hull fittings/seacocks, rudders, and stuffing boxes (including the rudders). Propeller shafts may be included in the system, however, because they are connected to the engine via an oil-filled medium, i.e., the transmission, and because oil is an insulator, such an interconnection cannot be considered electrically sound. In order for propeller shafts and propellers to be included in the bonding system they should utilize a shaft brush, a device that, ideally, completes a low-resistance connection with the bonding system. Shaft brushes are specifically designed to maintain contact with a rotating surface. They resemble the brush used in an electric motors commutator and should be made from the same materialcarbon (check before you buy one). Conductors used to complete connections between bonding system components should be a minimum of 8 AWG, and if doing double duty as a lightening system, then it must be a minimum of 6 AWG (the smaller the number, the larger the wire). Ideally, rather than interconnecting each item to the next in daisy chain fashion, bonding systems should use central bonding buses (copper strips that run the length of the vessel), to which various items are then connected by short(er) lengths of cable. The manner in which connections are achieved with the bonding strip is critically important. In no case should self-tapping, sheet-metal, or wood screws be used. If machine screws are used the strip must be thick enough to be tapped and allow a minimum of four threads of engagement. Otherwise, through bolts and nuts may be used to connect a wires ring terminal to the strip, whose thickness must be a minimum of 1/32 inch and the width of all strips must be no less than 1/2 inch. If, as is often the case, wiring ring terminals are connected to a bonding strip using self-tapping screws, which pass through the strip and into fiberglass, or worse, wood, then you can be assured of a poor connection. In almost every case when I inspect vessels whose bonding systems are wired in this manner, I universally find loose connections. Such connection methods are also not ABYC compliant. There is an alternative to the stem-to-stern copper bus bar/strip, one that is especially useful in after-build installations. Installing a series of purpose-made, tin-plated bonding bus bars in various locations around the vessels machinery and bilge spaces, each of which is interconnected using marine-grade, tinned cable, will provide the installer with convenient, reliable bonding points. Its important to note that the soundness of the connections in a bonding system will bear heavily on its effectiveness. Because the voltage and current that such a system is called on to transport are often quite low, the resistance must be equally low. 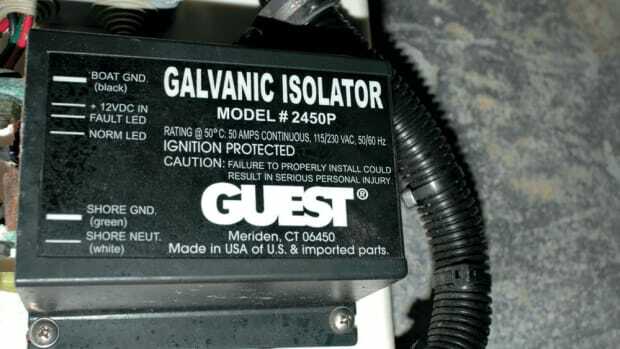 Resistance between any two points in the system must not exceed one ohm, a high standard for conductivity, indeed, and often a tall order considering so many bonding connections are located in the bilge. Bonding system connections should be periodically inspected for corrosion and fastener tension. Using a conductant paste, such as Thomas and Betts Kopr-Shield, when making connections and then coating them with a corrosion inhibitor, such as CRC Heavy Duty Corrosion Inhibitor, when complete, will ensure long-term reliability. The reason for interconnection of this seemingly disparate gear is twofold. One, bonding provides a low-current path to ground for stray current. Stray current corrosion, which is nearly always DC, is especially destructive and rapid and can consume a propeller or turn a shaft into a useless mass riddled with holes in a matter of days. Its source is typically a positive DC wire that comes into contact with bilge water; its often associated with bilge pump wiring. In the presence of a sound bonding system, the likelihood of severe stray current corrosion damage is reduced, although not eliminated. Second, and relevant in PMMs test vessel case, when the bonding system is connected to a sacrificial anode, as it always should be, then that anode will afford protection to all metals that are interconnected and immersed in the same body of water. Such an arrangement makes it easier for a vessel operator to protect multiple metals by maintaining just a few anodes. If the metals are not in the same body of water, then hull anodes will do nothing to prevent corrosion. For example, the engine and generator contain sea water; however, for all intents and purposes it is not the same water as that in which the vessel floats. Therefore, hull anodes will do nothing to prevent corrosion within the engine and generator and the anodes in the engine and generator will not protect, or be consumed by, metals located on the outside of the hull, even if they are connected to the bonding system. It is for this reason that engines and generators include their own sacrificial anodes. Next month Ill talk more about anode selection, installation, and maintenance, along with galvanic isolators and why they are so important. Ill also share with you the results of the bonding system inspection.